Հանդիպման գլխավոր հարցերը հետևյալներն էին. ↑ "Agreement Regarding Japan," Protocol Proceedings of the Crimea Conference (February 11, 1945). 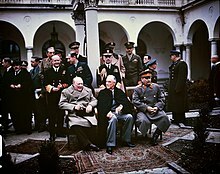 [Online at http://avalon.law.yale.edu/wwii/yalta.asp](http://avalon.law.yale.edu/wwii/yalta.asp). ↑ Telegram, President Roosevelt to the British Prime Minister, Washington, 11 March 1945, in United States Department of State, Foreign Relations of the United States, Diplomatic Papers: 1945 Volume V, Europe (Washington: Government Printing Office, 1967), pp. 509-510. Fraser J. Harbutt, Yalta 1945: Europe and America at the Crossroads (Cambridge: Cambridge University Press, 2010). Geoffery Roberts, Stalin’s Wars: From World War to Cold War, 1939-1953 (New Haven: Yale University Press, 2008). Geoffery Roberts, "Stalin at the Tehran, Yalta, and Potsdam Conferences," Journal of Cold War Studies 9:4 (Fall 2007): 6-40. Gideon Rose, How Wars End: Why we always fight the last battle, a history of American intervention from World War I to Afghanistan (New York: Simon & Schuster, 2010). Especially ch. 3. O'Neil, William L. World War II: a Student Companion. New York: Oxford University Press, 1999. Persico E. Joseph Roosevelt's Secret War. New York: Random House, 2001. "Portraits of Presidents: Franklin D. Roosevelt." School Arts Magazine February 1999: 37. Student Research Center. EBSCO Host. Philadelphia. April 2, 2006. Keyword: FDR. "Yalta Conference." Funk and Wagnalls New Encyclopedia. World Almanac Education Group, 2003. Sirs Discover. Philadelphia. April 2, 2006. Keyword: Yalta Conference. Yalta Conference, 1945: actual issues of history, law studies, political science, culture studies and philosophy / materials of the international scientific conference Yalta-45/13 (Simferopol, Ukraine 23-27 April, 2013 ) / edited by Oleg K. Shevchenko. – Simferopol: publishing house К.О.Ш., 2013. – 152 р. Special German series 2. The Committee on Dismemberment of Germany Allied discussions on the dismemberment of Germany into separate states, March 29, 1945. The committee was ordained at Yalta.